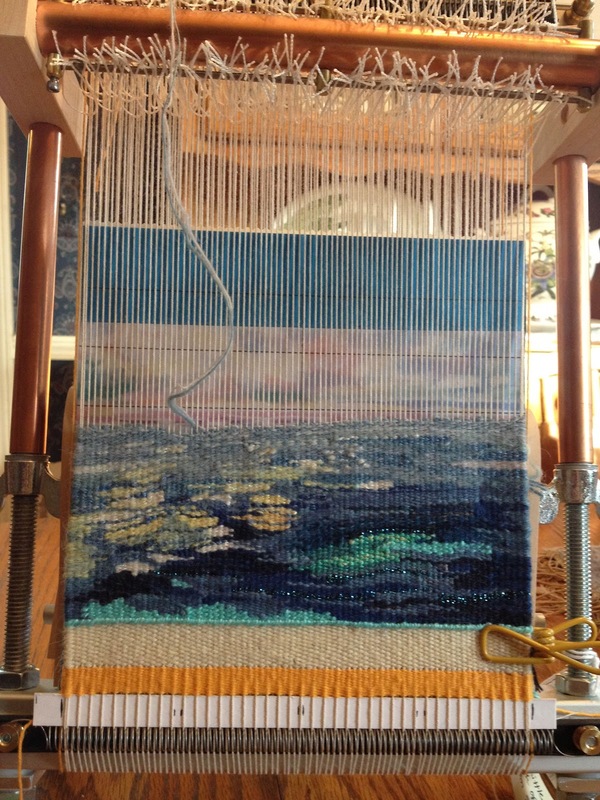 J Meetze Studio/Common Threads: Progress! 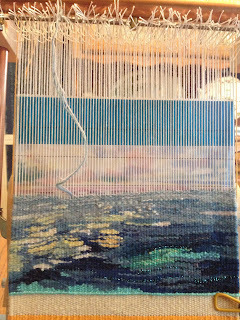 I am working on the "Riverside" tapestry on my Little Guy Loom, 8 inches wide at 10 epi and I am just about to run aground! 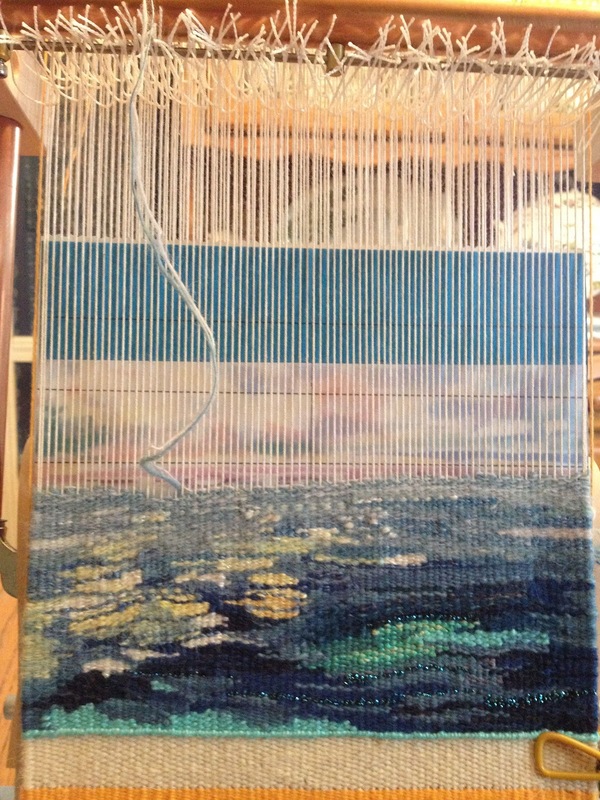 It will have wool, cotton, silk, rayon, linen and lurex weft threads and hoping to have it finished soon. I live close to the Arkansas river and I often walk my dog Laddie on the trails there so I have spent a lot of time observing and sketching the river. It is as close to the ocean as I can get in Oklahoma and I have always been fascinated by the play of light on water. Today is the day to finish the warp on Wimsey for the workshop which is coming up the first weekend in May. I have been waiting on more 10/2 pearl cotton in color 48 Deep Turquoise. I thought I was being thrifty by using one I already had but it ran out about an inch before the warp was done and for some reason that color was backordered at all of my normal sources. I ended up getting it from Camilla Valley Farm. I really like that color so no harm done and I have plenty now. 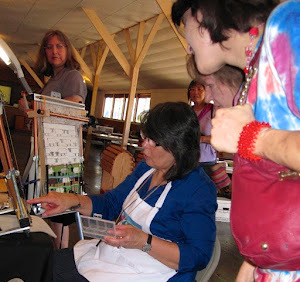 I have done a few sketches and barely started weaving on the LeClerc Gobelin Loom also known as Collette. There is not enough weaving for a picture yet but I am sharing one of the rough sketches. 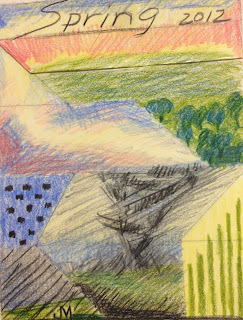 I want to weave this without a cartoon behind but a sketch or two seemed like a good idea to organize my thoughts. Since I am starting in the middle of April I decided to just begin with some general spring weaving and then maybe I can catch up to the daily calendar idea by June.